This was my breakfast yesterday. Oatmeal with blueberries and honey, topped with granola. I was starving when I got home from dropping my girls off at a school and couldn't imagine running when I was that hungry. So I ate breakfast and then ran. Usually I just have a banana before I run and, more often than not, a smoothie after my run. But that wasn't going to cut it yesterday. Luckily it was a rainy, overcast morning, so I waited a little while for my food to digest before I headed out the door, and it wasn't too hot when I finally got out there. And this was my lunch. I am trying to eat more filling things for lunch so I don't get so famished between lunch and dinner. This was two eggs scrambled with spinach and mushrooms, topped with avocado and salsa. I could eat this every day. Last night my girls couldn't fall asleep because of the thunderstorm happening outside their windows. 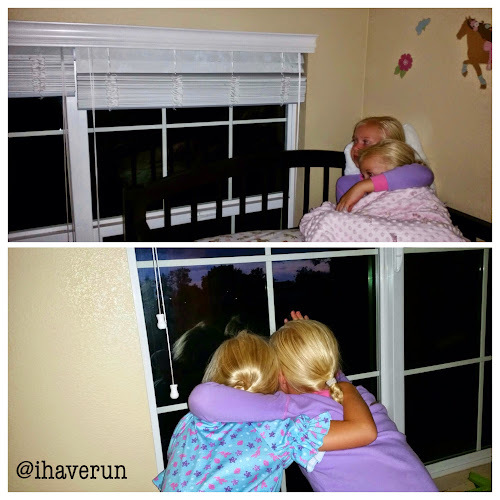 So we read about what makes thunder and lightening HERE, looked at some cool pictures of lightening online, and then they snuggled up together to watch the light show in the sky. Yes, it was obvious this morning that they didn't fall asleep until after 9 pm, but some memories are worth the morning grumpies. Are you a morning person or a night person? As long as I get my 8+ hours of sleep, I can be either.